Order now and receive free freight! Every CONFAST® Wedge Anchors are in stock for immediate shipping. CONFAST® Wedge Anchors are designed to be used in solid concrete. They should never be used in porous, hollow materials, such as brick or CMU block. 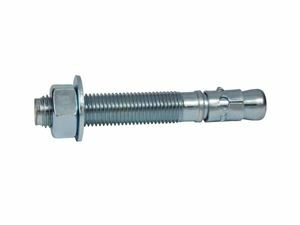 The CONFAST® Wedge Anchors are manufactured from different types of materials and coatings for installation in a range of environments. The wide choice of diameters available allow the CONFAST® Wedge Anchor to be used in applications varying from light to heavy duty. 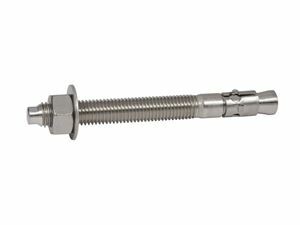 The Wedge Anchor has the most consistent holding values in solid concrete than all other types of expansion anchors. 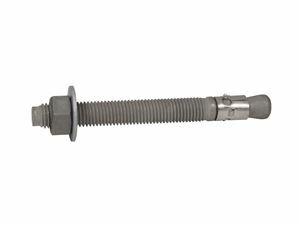 The expansion clip that is permanently attached to the CONFAST® Wedge Anchor is made from the same grade of material as the anchor body, with the exception of the hot-dipped galvanized, which has a 304 stainless steel clip. 304 Stainless Steel CONFAST® Wedge Anchor has a 304 stainless steel clip; the 316 stainless steel CONFAST® Wedge Anchor have a 316 stainless steel clip permanently attached. For information and technical specification, click on the blue link "TECHNICAL INFORMATION". This page displays the technical specifications for the CONFAST® Wedge Anchors. Click on the installation link to view a short video that describes the steps to install the CONFAST® Wedge Anchor. Written step-by-step instructions are also included.